Need a new iPhone 5S? 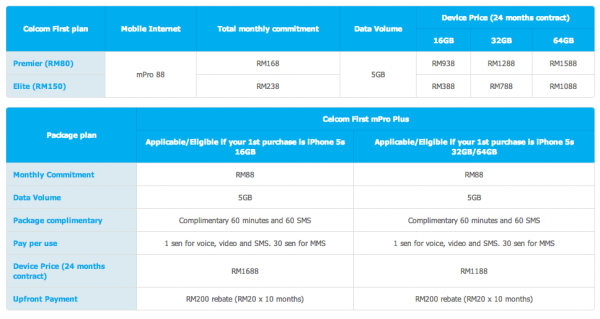 Well, how about two because Celcom is rewarding its loyal customers, giving subscribers a chance to get a brand new iPhone 5S from as low as RM388 and get a second unit from RM1,188; that’s more than half off the retail price of the device. The promotion is valid immediately and will end on 31 August 2014 or while stocks lasts. It’s written on Celcom’s promotion page that the call and SMS rates for mPro Plus for the second iPhone 5S is at 1sen/min/SMS but we’re pretty sure it’s a typo because the regular rates for mPro Plus plans are at 15sen/min/SMS. Check out Celcom’s promotion page to find out more about the offer but here’s something you need to know before proceeding. The deal is only valid for Celcom subscribers who have been with Celcom for the past 24 months spending at least RM50 a month and have a good payment record for the past 3 months. If you take up the second iPhone 5S offer, you will need to sign up for a new number under your name and be tied to 24 months contract as well. This means that you will have 2 lines tied for 2 years with Celcom. Interested? Visit Celcom to find out more.